Every year India New England showcases women who are "contributing to future generations." Award-winning Kahani magazine's Monika Jain and Sunitha Das were especially honored this year, and rightfully so. I love this magazine. I am not a kid, I do not have kids, and I do not have any kind of South Asian heritage (Germany is as close as it gets), but I LOVE getting this mag (and passing it on to local kids/schools when I finish). It's beautifully illustrated, well-conceived and often contains little gems of stories from familiar Child Lit names — all at a totally reasonable subscription price. Congratulations, Monika and Sunitha! 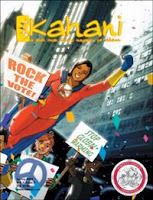 And if you aren't already subscribing to Kahani, why wait?